When friend and wine critic Ian d’Agata – also project manager for the prestigious Merano Wine Festival – asked me to co-moderate a comprehensive vertical of white vintages reaching back to 1970 from the celebrated Domaine de Chevalier, I was thrilled. 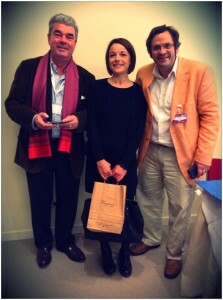 Domaine de Chevalier owner Olivier Bernard – who has been president of the UGCB for just over a year – combines both passion and intelligence in his presentations, which are always revealing, so it was also an honor to be part of a panel that included Bernard, Ian, celebrated wine writer and critic Charles Metcalfe and journalist Fernanda Roggero of the Italian daily Il Sole 24 Hore. 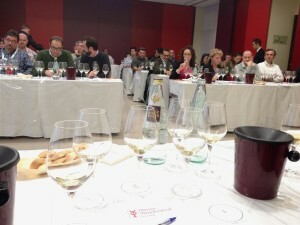 Almost all the wines below were at least very good, with some quite amazingly so… Wines in bold, I liked in particular. When red and bold even more. If underlined, too, the most. 2010: Almost a shame to try today, but not as cutting or sharp edged as one may think, remarked Roggero. White pepper, light notes of pear, a touch of Kiwi, and such gorgeous concentration on the mid palate – sap, and more sap – but never heavy handed. The integration of new oak – about 35% – is perfect. The finish gives you a sense of some steeliness, a coiled in aspect, demanding some time to settle. But this wine is full bodied and vivacious. Superb potential, but not ready to drink. If you have any, please do not bother for another 10-15 years. I know, sounds nuts – but your patience will be rewarded in spades. 2008: More balsamic and herbal. Some licorice notes and one participant felt as if the oak was showing through more here, but I could only disagree. This wine somehow managed to combine laser like precision and smoothness. Its purity of lime like citrus was very subtle, not Sauvignon “varietal” as Bernard likes to say. The finish went on and on and was marked by lifting freshness. I am thus very happy to own three bottles… and should get more. 2005: This is a warmer vintage – and it showed. A warmer nose, some licorice, and more “orange” than “lime” on the citrus register. The palate was rich but never over the top – nicely “contained” by a certain “power” that Bernard said would help it age (more so in this case than its acidity). Ian made the comment that, if served from a black glass, one could confuse this with a red. Interesting! Although I liked it, the 2005 does not reach the heights of the 2008 or 2010. It would certainly go well today with roast chicken, fish in a cream sauce or even veal in a cream sauce with mushrooms. 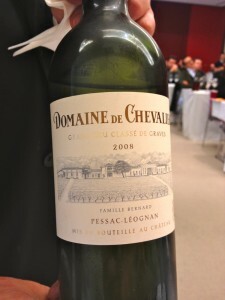 2000: I recalled tasting a blind horizontal of 2000 whites from Pessac Leognan where Domaine de Chevalier outpaced them all in terms of freshness. As Bernard pointed out, “red vintages” are not always “white vintages” (and vice-versa) and 2000 is a case in point for the former. While celebrated for reds in Bordeaux, 2000 was a bit too warm for the whites. So this was perhaps among the most evolved of the whites served… but still good, mind you. It showed just a vague “peek” of oxidation, but excellent corpulence and medium plus body on the palate, and conveyed enough freshness to go well with, say, linguini and scallops in a cream sauce. Do not hesitate to open if you own any. At this stage, Bernard explained that – while the 2000 did indeed show some hint of oxidation – tasters sometimes confuse oxidation with reduction in older white wines. He said that one distinguishes reduction from oxidation by the brilliant tone of the wine. “An oxidized old wine will be dull in appearance, not brilliant,” Bernard said. Age darkens white wine over time – from straw to light gold to orange – but the wine is not necessarily oxidized. If the aspect is “brilliant” it is more likely to be reduced than oxidized, he explained. “And I like to go for gold,” he remarked, indicating his preference for properly aged whites that may look “old” but if they are brilliant – with éclat, with luster in appearance – then they can be great old whites. We did not get into a discussion of how much sulfur was added in the 1970s, but certainly the vintages we tried from that decade were made from grapes picked earlier with more sulfur added – or at least not “as carefully added” as is done today, Bernard remarked. In any case, the amazing thing about all the wines tasted after the 2000 was that they most all had – more or less – a reductive aspect, as indicated by their brilliant tones. It was amazing – as Charles Metcalfe noted – to see the wines open up in glass. “At first,” he said of the 1996, for example, “I thought it was oxidized, but it was in fact reductive – and the wine just opened up in glass,” he said. Speaking of the 1996… While darker than the 2000, it tasted more youthful. And, yes, it exuded a brilliant tone. Complex aromatics included pine cone, pit of apricot, fruit basket, a mint veering towards eucalyptus freshness, and a touch of hay field. What a lovely wine! But it truly needed time to open up – and Bernard said how his whites need to be decanted beforehand, to handle the reduction more quickly. But let me say this: it got better with the 1991. This was the year of an extreme frost in Bordeaux – on 21 April – that reduced the crop massively. A very difficult vintage, too, as rain poured on the vineyards in September, but the summer was rather good and white grapes, picked before the rains, fared well – as we tasted in Merano! Here an example of red-white opposites, again, but this time working in the white favor. The tone? Remarkably bright. The aromatics conveyed a crystalline raspberry like fruit, vibrant on the nose. The palate was laser like and energetic – and just exciting to drink. The panel clinked glasses with this wine, it was so good! Interestingly, when tasted in February 2011 in Washington D.C., the 1991 impressed less. Better bottles in Merano? Then came two vintages from the 1980s – both somewhat cooler vintages. In opening remarks, Bernard said reds are “wines of the earth” while whites are “wines of the sky” and that he loves the sky: J’aime le ciel. Continuing the metaphor, he said that some vintners/winemakers like to make “horizontal wines” – wines with more evident richness and breadth, perhaps with the new oak coming through more evidently with vanilla notes… for example. Bernard likes to make “vertical wines” that have more vivacity and resonance. In a sense, such wines reach the sky. The 1986 had an initial nougat like nose, with reductive notes vaguely akin to a struck match. Time in glass revealed quince jelly and wet stone. The palate vibrant and citrus – again showing some exotic citrus (kiwi) – but never, ever obvious. Domaine de Chevalier generally displays subtlety and 1986 is a good example. It is also “coiled in” somewhat and should you have any, you could hold on to your bottles for another 10 years no problem. The finish ended on a note of tobacco leaf, quite mineral. The wines of the 1970s were a treat to taste. If I recall correctly, the 1983 was the first vintage that Bernard actually vinified – as he had purchased the estate that year. So the previous vintages were not his. And they do come from “another era” when grapes were picked earlier with more evident acidity (with not always adequate ripeness). One of the three did have a slight green pea aspect, as Metcalfe noted, but it was pretty good, while the other two proved good to excellent. Yes, the 1978 was a bit under ripe, but it was interesting to taste. The color was quite youthful looking and there were notes of reduction, quite strong notes, which had prompted my question about sulfite levels… In any case, the wine was punchy and juicy on the mid palate but just a bit green on the somewhat edgy finish. Next came the 1975 – which was smoother, displaying an herbal minty aspect – and thirst quenching salinity. Perhaps a touch of Xérès, but Bernard said that this was a form of “good oxidation” as it did not perturb the taster, and rather complemented the wine. I got his point and enjoyed it very much. 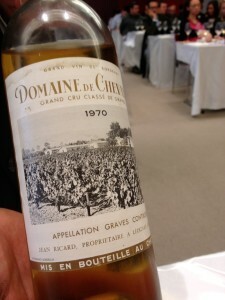 But the best of the 70s vintages – and we all thanked Bernard profusely because he only had about 12 bottles left of each at the chateau – was the 1970. Smooth and spherical. You know how you could have a “modern wine” that is all gloss, but – like an empty shell – it lacks nuance? This is the polar opposite. It is a wine that is at its prime. It probably won’t get any better with age, but has layers of interesting flavors – for example somehow managing to convey a “fresh” aroma of dried apricot, dry fruit in general… And a lingering finish. 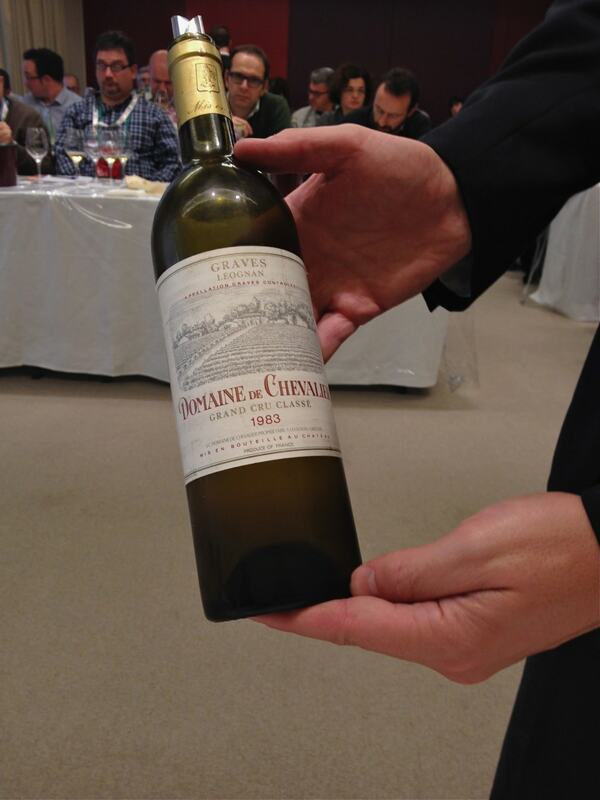 Technical note: Generally the whites of Domaine de Chevalier blend about 75% Sauvignon Blanc and 25% Semillon. Older vintages have a bit more Semillon. For example, the 1996 has about 30% Semillon and both the 1986 and 1983, 35% Semillon. They are aged – on average – in 35% new oak. My friend and fellow wine writer Izak Litwar has an excellent page on his website about Domaine de Chevalier, with plenty of useful information – including his impressions from a massive vertical back in 2005. 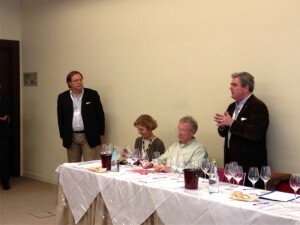 And a vertical I had co-hosted in 2011 in Washington D.C. featuring both reds and whites from the estate: interesting how the 1991 in Merano showed better in 2013 than it had done in Washington D.C. in 2011. Thanks for linking to my webpage. Actually, I don’t think Olivier made 1983 white single handed. It was Claude Ricard who made it with contribution of Olivier as he was still learning tricks. As far as I’ve been told, Olivier’s first vintage on its own is 1988 (both colours). I agree on 2010, 1991 and 1970. Hello Izak! Thanks for your comment and precision on the 1983. I know how much you know Domaine de Chevalier. It is always so great to meet you in Bordeaux – and sometimes end up at Domaine de Chevalier and compare notes. Cheers! I arrived at Domaine de Chevalier on 1 August 1983 and very quickly, I changed some “details” regarding the sorting of the grapes in the vineyard during the harvest, and our ways regarding the new barrels. In 1984, I set up the leaf thinning and green harvesting. At the same time, a strengthened team of harvesters has allowed us to make the picking only in the morning when the grapes are fresh. We renewed wine presses and built a cold room, for temperature control of the musts. Search of optimum ripeness has also become a priority. Here “a few details” that have contributed to the quality of our wines. Thanks Olivier for the time to post comments. Your wines are great!